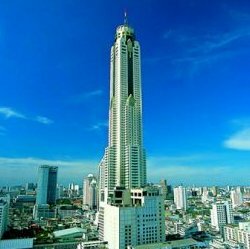 Two of the most distinctive towers in Bangkok, Baiyoke Tower and Baiyoke Tower 2, tower over Ratchathewi. The district also has Pratu Nam, a shopping centre known for cheap clothing; the Pantip Plaza, the biggest shopping hub for I.T. products in Thailand; and several low-key nightspots, bars and cheap restaurants known to locals and a few tourists.